Hello Future Helping Professionals and Advocates! 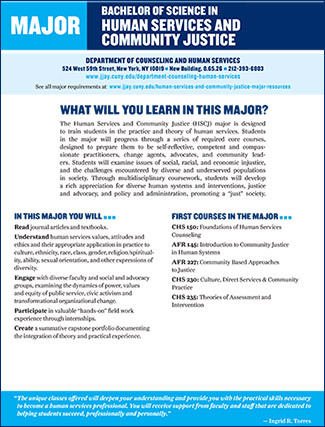 John Jay College now has a new major in Human Services and Community Justice (HSCJ)!! Learn More about the New Major! Many of you have expressed interest in majoring in this field, and now you have this unique opportunity to do so. The HSCJ major is ideal for students planning careers in social work, counseling and community advocacy. We encourage all students to now consider this option. For information about the Human Services and Community Justice major requirements, see the 2018-2019 Undergraduate Bulletin. To change your major, you will need to fill out an Undergraduate Declaration of Major Form found on the Jay Stop Website (found under My JJC/Change My Info/Declaration of Major). You will be asked to log in using your John Jay email Username and Password. If you are unable to get to campus, you can complete the form and return it via email to departmentofcounseling@jjay.cuny.edu . Be sure to use the email subject “Major Declaration”. Ms. Shelby will confirm receipt and the form will be submitted to the Registrar. You may also return the form to the Department of Counseling & Human Services at L 8.65.26 NB or take it directly to the Jay Express Services Center L.69 NB. Welcome to all of the Helpers & Advocates declaring the new Human Services and Community Justice (HSCJ) major!